If you enjoy waking up to the soothing sounds of rushing water, the smell of Douglas Fir and stovetop coffee then you’ve come to the right place – the Sooke Potholes Campground, owned by the CPG T’Sou-ke First Nation Opening May 21, the campground contains over sixty tent and RV sites including a special by donation bicycle camp, just off the Galloping Goose Regional Trail. If you enjoy waking up to the soothing sounds of rushing water, the smell of Douglas Fir and stovetop coffee then you’ve come to the right place – the Sooke Potholes Campground, owned by the CRD. Opening May Long Weekend, the campground contains over sixty tent and RV sites including a special by donation bicycle camp, just off the Galloping Goose Regional Trail. 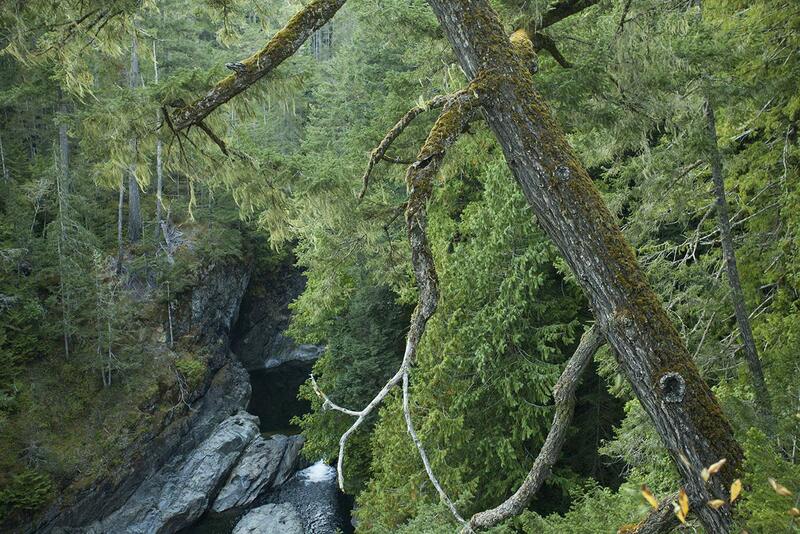 Located at the north end of Sooke Potholes Regional Park, recreation, nature, and family fun are just a step away. 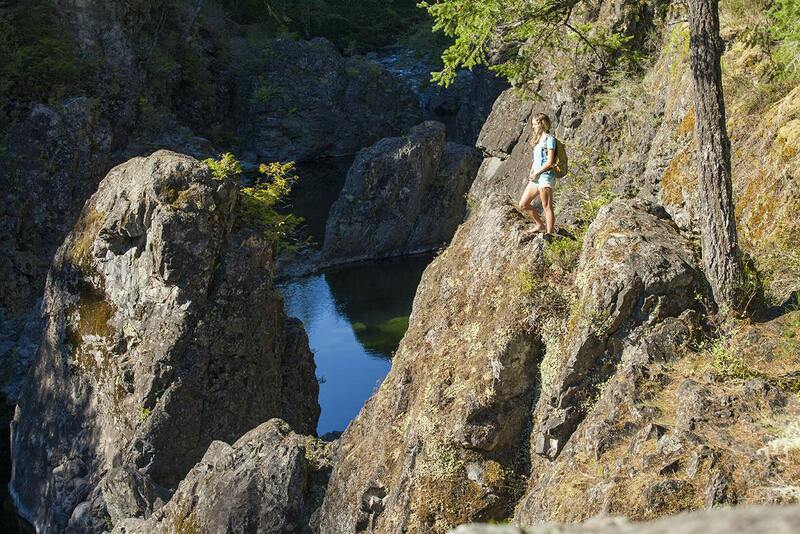 Sooke Potholes Regional Park is located on the banks of the spectacular Sooke River. Enjoy the views, explore the trails or take a refreshing dip on a hot summer day! You can picnic or swim at the river, explore the short forest trails or enjoy the stunning vistas from one of several viewpoints. You may see black-tailed deer, red squirrels or bald eagles riding the breezes overhead. The “potholes” are unique geological formations – deep pools in the river rock – that offer some of the best freshwater swimming in the region. The Sooke River is the second largest on southern Vancouver Island and home to a productive salmon run every fall. 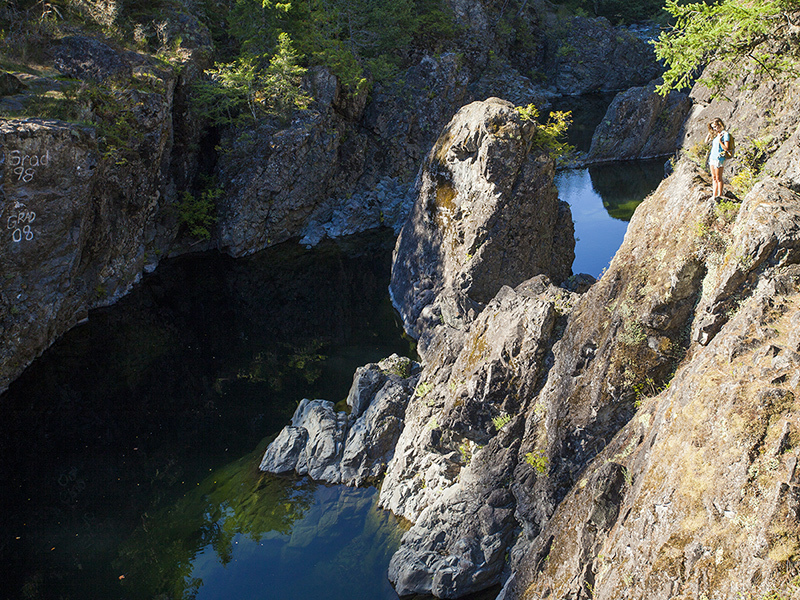 Sooke Potholes Regional Park is a great starting point for a trip by bicycle or on foot on the Galloping Goose Regional Trail. Travel south toward Roche Cove Regional Park, or through wilderness scenery all the way to the end of the trail. 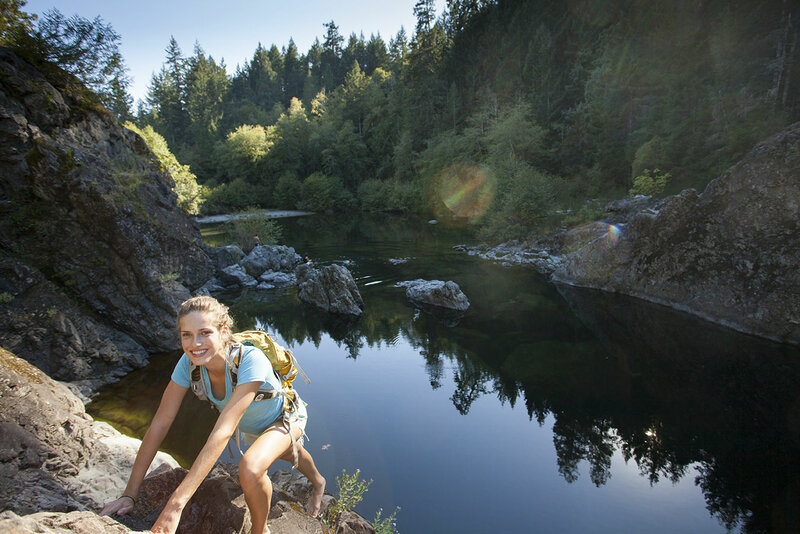 The CRD is pleased to announce the transfer of Sooke Potholes campground to the Region, with the support of The Land Conservancy of British Columbia (TLC) in consideration of their overall restructuring plan. As a result of the transfer, the CRD passed the campground (now called the “Spring Salmon Place Campground”) to the T’Sou-ke First Nation who previously expressed an interest in operating the campground. The park is near the south-west corner of the Sea to Sea Green Blue Belt Regional Park Reserve, a corridor of protected green space linking Saanich Inlet in the east to Juan de Fuca Strait in the west. The Sea to Sea Green Blue Belt separates the developed urban area of the Capital Region from tracts of forest land to the west.